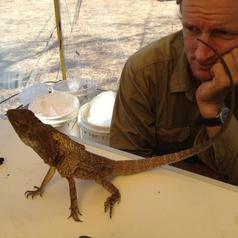 Eric is a terrestrial field biologist studying the effects of differing land management activities (e.g. grazing, clearing, weeds, fire, feral species) on vertebrate fauna. He maintains the Black-throated Finch database on behalf of the Black-throated Finch Recovery Team. He is also the author of Field Guide to the Frogs of Queensland.